The entire family can now enjoy this playground Portable Tetherball Set at home! 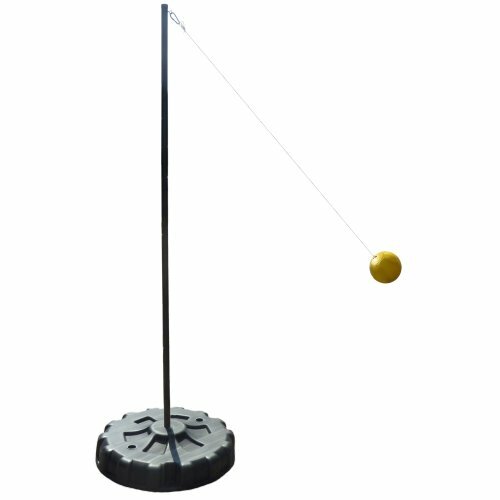 The base is durable and easy to move by holding the tetherball pole and rolling the base to the desired location of cement or grass. The Tetherball is soft to the touch. The set comes with a free bonus ground stakes. You can use it as is on a grass location with the 3 included stakes. The bottom of the base also doubles as a storage unit for your tetherball poles during non play times to save you storage space. Exclusive product features includes; base to pole connection without the need for a metal base plate or wheels for portability. This tetherball set combines portable play for the cement or the grass yard play too. Ground stakes included for grass play go into the base. Heavy Duty 8-1/2' Tetherball Steel Pole. The pole is weather resistant and powder coated for a long lasting finish. Durable HDPE Black Base size of 30" diameter x 6.5" Height that easily fills with water or sand for support. Soft Touch 8" Regulation Size Tetherball with a 72" Nylon Cord and steel hook attachment. Bonus Ground Stakes if you would like to fix the tetherball set onto the grass at a later time too. Full Product Warranty for 60 Days! Exclusive product product features! If you have any questions about this product by Verus Sports, contact us by completing and submitting the form below. If you are looking for a specif part number, please include it with your message.